Shutter is a multifunctional scheduling utility, which has a user friendly and easy-to-use interface and supports many different Events and Actions. Events: Countdown, On Time, Winamp Stops, Low CPU Usage, User Inactive, Battery Low, Window Closes, Process Stops, Ping Stops, File Size Limit. Actions: Shutdown, Reboot, Log Off, Lock Workstation, Sleep, Hibernate, Monitor Turn Off, Un/Mute Master Volume, Hang Up, Alarm, Play Sound, Execute Program. 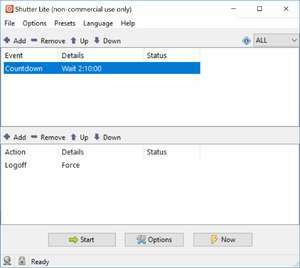 For security reasons, you should also check out the Shutter download at LO4D.com which includes virus and malware tests. Additional screenshots of this application download may be available, too.